Brittanys were bred as gundogs, and they definitely have birds on the brain. Although they’re often called Brittany Spaniels, the American Kennel Club dropped the word “spaniel” from this pointing breed’s name in 1982. The energetic Brittany is a versatile family companion and hunting dog who works more closely to the hunter than other pointing breeds. See all Brittany dog characteristics below! The Brittany is a happy, elegant gundog who is alternately described as hyperactive and as the perfect family friend. The truth depends on your own interests and activity levels. Like all sporting breeds, the Brittany has energy to spare — he is certainly an Energizer Bunny of a dog — and that combined with his other qualities can make him a good fit for the right home. Brittanys are remarkable in many ways. Their medium size — 30 to 40 pounds and 17 to 20 inches tall — is attractive to families and sportsmen alike. They're not too big to stay in the house or travel with you in your car if you have a passion for hunting. And they're versatile. Brittanys have won more dual championships than any other breed. A dual championship means that the dog has won championships in both field trials and conformation shows. However, the Brittany isn't for everyone. For one thing, his energy level might be more than many people bargain for. Brittanys have an irrepressible joy of life and a high level of enthusiasm for everything they do, whether that's playing with the kids, seeking out birds, or simply enjoying life with a good, stretched-out, no-holds-barred run. If you don't have the same energy and enthusiasm, it can be difficult to keep up with a Brittany. Because of his extraordinary energy, it's important to provide him with plenty of exercise. A walk around the block isn't enough. If his basic need for exercise and a job to do isn't met, he may become neurotic and hyperactive, expending his energy in ways that you probably won't like. All dogs like to have "work" to do, but Brittanys are especially task-oriented. You can't leave your Brittany home alone all day while you go to work and then expect him to be mellow and want to lie at your feet when you come home. Not going to happen with this dog! He will have a day's worth of energy and affection pent up, and he'll be bursting at the seams to expend both. Brittanys require an hour or more of exuberant exercise every day, which makes them unsuitable for most apartment dwellers. If you're looking for a Brittany puppy, you may hear breeders differentiating between "American" Brittanys and "French" Brittanys. 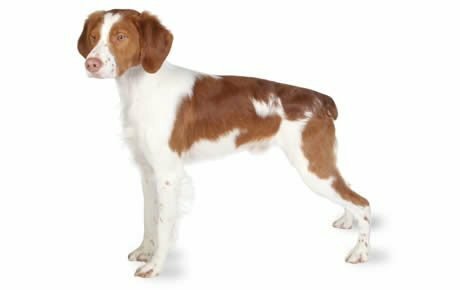 Both are the same breed, but the American Brittany is taller and faster than the French Brittany, which is smaller and generally works more closely to the hunter. Brittanys are known for being sensitive to harsh treatment. A stern look or a sharp word is often sufficient punishment when your Brittany is acting up. Train them firmly but gently, using positive reinforcement techniques such as praise, play, and food rewards. Because of their happy, friendly nature, Brittanys are good with children and other pets. Their exuberance, however, make cause them to accidentally injure a small child, so be sure to supervise your Brittany when it is playing with your children. If you purchase your Brittany to use for hunting, you'll find that he works much like a pointer, with a smaller range. Brittanys point on game and willingly retrieve both on land and in the water. Brittanys have a natural instinct for hunting, which makes them a good choice for people who are new to the sport of hunting. If hunting is not the sport for you, consider participating in agility, flyball, or other such activities with your Brittany. Your dog will love it, and so will you! If you can keep up with the Brittany's exercise needs and need for a job, you'll find that he's a great family companion. Brittanys are good-looking dogs who attract compliments. Their grooming needs are relatively simple. They're always happy, friendly, and affectionate. They could well be the perfect dog for families who play hard, love the outdoors, and want a dog to share it with them. Brittanys are high-energy dogs. They need at least an hour of intensive exercise each day. Without sufficient exercise, your Brittany may become neurotic and destructive. Brittanys are smart and need mental stimulation as well as physical exercise. 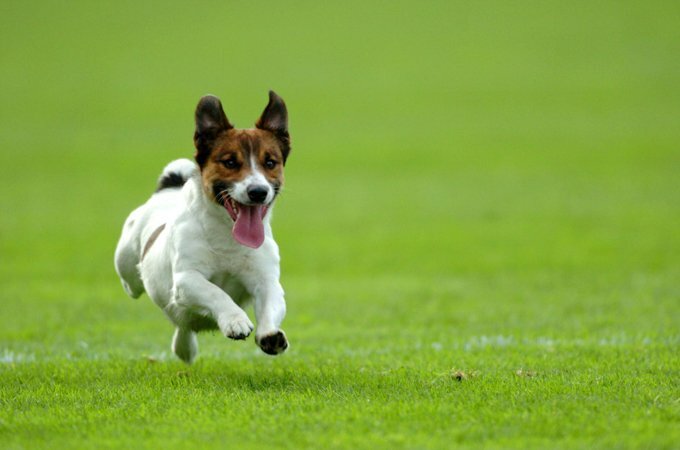 Training for dog sports is a great way to provide this. Brittanys don't respond well to harsh treatment. Be gentle and consistent but firm — don't let them run the household. Brittanys are people-oriented and don't like to be left alone for long periods of time without something to keep them busy. If you work outside the home, you should consider getting two Brittanys to keep each other company. Although they are friendly and like children, it's not recommended that you let your small children play with your Brittany without supervision. Your Brittany has so much energy and enthusiasm, he may accidentally injure your child. The Brittany takes his name from the Celtic area of northwest France that was once an independent kingdom. Brittany lies just across the English Channel from Wales, and for well over a thousand years there was a great deal of commerce between the two countries, with dogs surely being a part of that trade. It's easy to see by their coloring alone as well as other physical characteristics that the Brittany and the Welsh Springer Spaniel probably had common ancestors. The first records of Brittany-type dogs are visual: paintings and tapestries dating to the 17th century. They show a liver and white dog pointing partridge. Modern Brittanys started to take shape in the mid-1800s in Pontou, a small town in Brittany. It's said that they were the result of a cross between a white and mahogany female owned by a French hunter and a lemon and white male brought to Brittany for shooting by an English sportsman. Of the two pups they produced, one was considered to have the requisite hunting ability and became a popular stud in the area. The result was bob-tailed dogs that pointed and retrieved. Apparently, local poachers were quite fond of them for their speed, agility, and willingness to take direction. Around the same time, dog shows became popular in Britain and other parts of Europe, including, naturellement, la France. Brittanys moved effortlessly from the field to the show ring and were recognized as a breed in France in 1907. The first French Brittany registered in that country was an orange and white dog named Boy. Brittanys didn't make it to the United States until 1931, but once they became known, they gained steadily in popularity. The first Brittany registered with the American Kennel Club was Edir du Mesnil, in 1934. The American Brittany Club was formed in 1942 and rewrote the French standard to suit themselves. Like so many breeds, Brittanys suffered a decline as a result of World War II. In France, breeding of Brittanys came to a halt during that time. After the war, French breeders decided to allow black spotted dogs in the standard because the gene pool was so depleted throughout Europe. U.S. breeders did not follow suit. Even today, black is not an accepted color for Brittanys in the U.S. and Canada, but it is accepted in all other countries. For many years, many breeders wanted to delete the word "spaniel" from the name of the breed because Brittanys are pointing dogs, not flushing dogs like spaniels. In April 1982, the AKC Board of Directors approved changing the name to Brittany, deleting the word "spaniel" as a part of the name. In some other countries, however, they still are called Brittany Spaniels. Today, the Brittany ranks 31st among the 155 breeds and varieties registered by the AKC. Brittanys are 17 1/2 to 20 1/2 inches tall and weigh 30 to 40 pounds. Brittanys are happy and alert. As befits a pointing breed, they are curious and independent, but respond well to their people and want to please them. They can be singleminded when it comes to birds, but when they're not focused on their feathered prey, they enjoy spending time with their people, especially if they're doing something active. Brittanys are not just energetic, they're smart, so they needs loads of exercise and mental stimulation each day. When it comes to training, be consistent but never harsh. Like every dog, Brittanys need early socialization — exposure to many different people, sights, sounds, and experiences — when they're young. Socialization helps ensure that your Brittany puppy grows up to be a well-rounded dog. Enrolling him in a puppy kindergarten class is a great start. Inviting visitors over regularly, and taking him to busy parks, stores that allow dogs, and on leisurely strolls to meet neighbors will also help him polish his social skills. Brittanys are generally healthy, but like all breeds, they're prone to certain health conditions. Not all Brittanys will get any or all of these diseases, but it's important to be aware of them if you're considering this breed. If you're buying a puppy, find a good breeder who will show you health clearances for both your puppy's parents. Health clearances prove that a dog has been tested for and cleared of a particular condition. In Brittanys, you should expect to see health clearances from the Orthopedic Foundation for Animals (OFA) for hip dysplasia (with a score of fair or better), elbow dysplasia, hypothyroidism, and von Willebrand's disease; from Auburn University for thrombopathia; and from the Canine Eye Registry Foundation (CERF) certifying that eyes are normal. You can confirm health clearances by checking the OFA web site (offa.org). Hip Dysplasia: Many factors, including genetics, environment and diet, are thought to contribute to this deformity of the hip joint. In mild cases, with proper diet and exercise the animal can lead a full and active life. In more severe cases, surgical correction may be required. Your veterinarian can x-ray your dog's hips for evaluation. Epilepsy: This disorder causes mild or severe seizures. Epilepsy can be hereditary; it can be triggered by such events as metabolic disorders, infectious diseases that affect the brain, tumors, exposure to poisons, or severe head injuries; or it can be of unknown cause (referred to as idiopathic epilepsy). Seizures may be exhibited by unusual behavior, such as running frantically as if being chased, staggering, or hiding. Seizures are frightening to watch, but the long-term prognosis for dogs with idiopathic epilepsy is generally very good. A dog can live a full and healthy life with the proper management of this disorder. While epilepsy can't be cured, it often can be controlled with medication. If your Brittany has seizures, take him to the vet right away for a diagnosis and treatment recommendations. Hypothyroidism: This condition is caused by an abnormally low level of the hormone produced by the thyroid gland. A mild sign of the disease may be infertility. More obvious signs include obesity, mental dullness, drooping of the eyelids, low energy levels, and irregular heat cycles. The dog's fur becomes coarse and brittle and begins to fall out, while the skin becomes tough and dark. Hypothyroidism can be treated with daily medication, which must continue throughout the dog's life. A dog receiving daily thyroid treatment can live a full and happy life. Brittanys are active, indoors and out. They do best if they have a large yard or, better yet, some acreage where they can run off some of their excess energy. They're not best suited to apartment life or city living unless you truly have the time and dedication to provide them with the amount and type of exercise they need. This breed is resistant to cold and damp conditions when hunting, but should live indoors with the people they love. Like any dog, they should be confined to a safely fenced yard when they aren't being supervised. Limit exercise to no more than half an hour at a time in puppies younger than two years of age. Their joints aren't yet fully formed, and neither is their muscle coordination and ability to focus. Take a break from training, play, or other activity any time your Brittany pup seems tired or unenthusiastic. Brittanys love to run in wide-open spaces. It's essential to teach them to come when called. Train them with firmness and consistency, but never be harsh. Often, a sharp word is more than enough to stop any misbehavior. Like any dog, Brittanys can be destructive as puppies. They can also be destructive as adults if their needs for mental and physical challenges aren't met. Keep them occupied with exercise and training, and crate puppies to prevent them from getting into trouble if you're not around to supervise. Recommended daily amount: 1.5 to 2 cups of high-quality dry food a day, divided into two meals. Keep your Brittany in good shape by measuring his food and feeding him twice a day rather than leaving food out all the time. If you're unsure whether he's overweight, give him the eye test and the hands-on test. First, look down at him. You should be able to see a waist. Then place your hands on his back, thumbs along the spine, with the fingers spread downward. You should be able to feel but not see his ribs without having to press hard. If you can't, he needs less food and more exercise. For more on feeding your Brittany, see our guidelines for buying the right food, feeding your puppy, and feeding your adult dog. Brittanys aren't heavily coated dogs. They have dense, flat, or wavy hair that's never curly, wiry, or silky. You'll see a little feathering on the ears and legs, but not so much that the Brittany would have trouble making his way through dense brush and undergrowth. You might notice that your Brittany's skin is fairly loose. Loose skin sort of rolls when it comes in contact with burrs and thorns, protecting the dog from puncture wounds. Most commonly, Brittanys are orange and white or liver and white. Sometimes their coats have a roan pattern, which is a fine mixture of colored and white hairs; for instance, orange roan. Some ticking — small isolated areas of black hairs on a white background — is desirable. Occasionally you'll see a tri-color Brittany, a liver and white dog with orange markings on the eyebrows, muzzle, cheeks, inside the ears, beneath the tail, and orange freckles on the lower part of the legs. Brittanys are easy to groom. Keep their coats in good condition with weekly brushing, and a bath or dry shampoo when necessary. They don't shed a great deal. Check the ears weekly for signs of infection such as redness or tenderness, as well as for foreign objects, especially if your Brittany has been out in rough or brushy terrain. Brush your Brittany's teeth at least two or three times a week to remove tartar buildup and the bacteria that lurk inside it. Daily brushing is even better if you want to prevent gum disease and bad breath. Trim nails once or twice a month or as needed. If you can hear them clicking on the floor, they're too long. Short, neatly trimmed nails keep the feet in good condition and protect your shins from getting scratched when your Brittany enthusiastically jumps up to greet you. Begin accustoming your Brittany to being brushed and examined when he's a puppy. Handle his paws frequently — dogs are touchy about their feet — and look inside his mouth and ears. Make grooming a positive experience filled with praise and rewards, and you'll lay the groundwork for easy veterinary exams and other handling when he's an adult. Brittanys are a good choice for a family with active children, but their energy level might be overwhelming for toddlers. Brittanys enjoy the company of other dogs and can also get along fine with cats, especially if they're introduced at an early age. Brittanys are often purchased without any clear understanding of what goes into owning one. There are many Brittanys in need of adoption and or fostering. There are a number of rescues that we have not listed. If you don't see a rescue listed for your area, contact the national breed club or a local breed club and they can point you toward a Brittany rescue. Below are breed clubs, organizations, and associations where you can find additional information about the Brittany.